my 3 year photography journey & reaching my 1000th post. 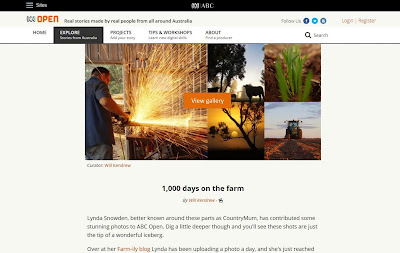 The Q&A 1000 Days on the Farm went live last night. Congrats. How you all work so hard and have time to photograph and post, amazes me. This is a wonderful honour and an encouragement to continue. Congratulations Lynda - a wonderful achievement and a brilliant write-up!! Huge congratulations. Well done. And I am glad you aren't ready to stop yet. Congratulations. 1000 posts are a lot, and only for a short time ago I found you. You have really lovely posts here. I feel fortunate to be one of those rural women who compare notes across the miles. I agree with so much of what you said, Lynda. I do think having a camera in hand helps us to see the beauty in the ordinary. Congratulations! Congratulations. It was very nice to read. : ) I'm happy to be one of your followers. Wow that is exciting and quite cool. Congrats. Second publicity, you are a media moll! I don't know why more people haven't produced a life on the farm photo blog, but at least you have. I really enjoyed reading this...I saw it last night but was too preoccupied to read it and savor it...I am so glad I found your blog. I used to always wish I could come to Australia. And still do, if it comes to it. Congratulations.